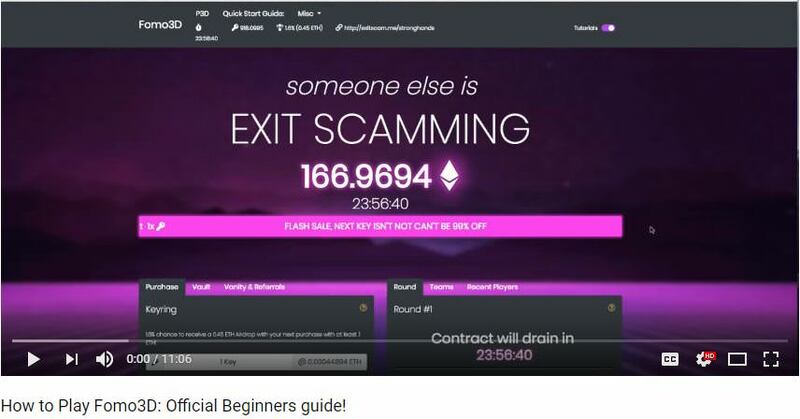 Fomo3D is a decentralized, trustless Blockchain game running on the Ethereum exit-scam Network. It is a parody of the cryptocurrency space as a whole, namely the seeming requirement of all ICOs (initial coin offerings) to run off with large amounts of unaccountable cryptocurrency. This game is ironically and intentionally on a fully open-source smart-contract in which us (the developers) carefully audited and designed the game to never give us access, or the ability to run away with the ethereum. We have no control of the funds or balance, and it's run entirely without human intervention based on the code! You might have read that before, our work, websites and interfaces are some of the most forked projects in cryptocurrency. 1. Metamask setup on your computer and/or TrustWallet on your mobile phone. 2. Ethereum available in your Metamask Wallet used to purchase keys. 3. 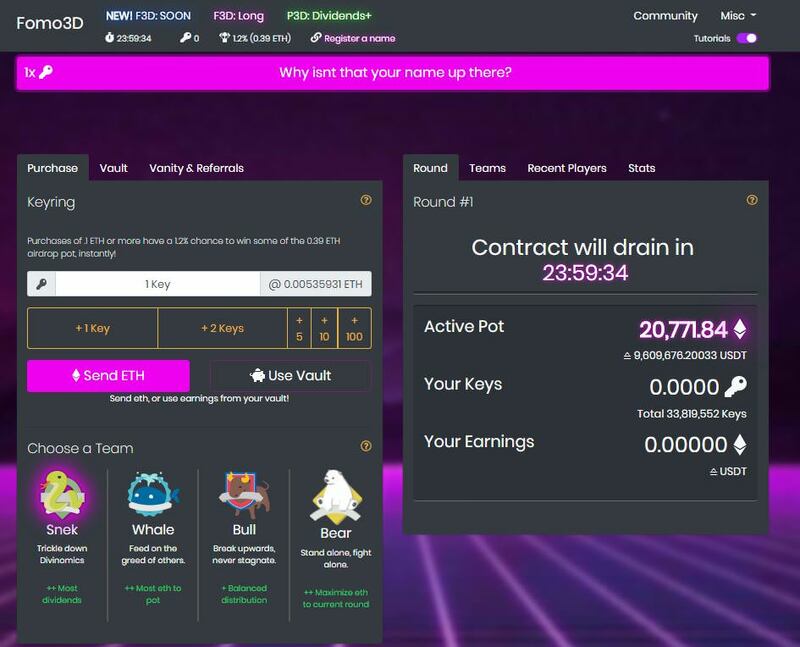 Visit the Fomo3D site and buy some keys! This is a LOTTERY game in which the grand prize winner is the last person to purchase a key before the countdown timer runs down to zero. During a round, a timer is constantly counting down to zero. Every time a key is purchased, the buyer becomes the new "holder of the private keys" and additional time is added to the countdown. There are two distinct modes of the Fomo3D game: long and quick each with varying rules and gameplay. Note that long mode is launching first and then quick mode will be released at a later date. For full details, check out the Game Modes section. Keep in mind that you are free to select a different team each time you purchase a new key. Glad to be here. Let us make Forum great again.